Thinking about getting another cat. Itchmo Forums for Cats & Dogs > Pet Behavior > Cat Behavior & Training > Thinking about getting another cat. Re: Thinking about getting another cat. It's so nice of you to want to take another kitty in and spare it from possibly going to a shelter. The first time I considered having more than one cat, I was pretty apprehensive, but really, it turned out to be more my concerns than the cats'. 1. Make sure the new cat is spayed or neutered or will be soon after you get it (unless it's a kitten and still too young) and has been checked out by a vet for fleas, ear mites, etc. 2. Find a spare room for the new cat -- one where you can close the door and preferably one with a window. Set the room up with toys, bedding, food, water and a litterbox. Bring the cat in and close the door. Keep it company periodically throughout the day. Your current cat will be sniffing around the door and the new cat will be sniffing from the other side. Keep this arrangement for a few days and feed both cats on either side of the door so they associate each other with something they like -- food. You can also play with them from the space under the door -- like pull a string and have them play with it at the same time. 3. After a few days of this, if you can get your hands on a couple of baby gates, stack them in the doorway so they can see each other without being able to harm one another. Make sure they can't climb the gates and get to the other side. I have a special door my husband constructed with bars that allow interaction, but not fights. 4. Once they can interact on either side of the gate without hissing and swatting, swap places. Let the new cat out into the main living area and let your current cat into the new cat's room. Let them wander, sniff and explore. Switch them back when your current cat wants out of that room. 5. Once they seem at ease with each other, let the new one out and supervise them interacting. If one of them starts a fight, throw a blanket over them and put them in another room to cool off. Using Feliway diffusers or spray can help. It really depends on the temperament of the cats. I have had as many as 5, none related to each other and they pretty much all got along. I know people with over 20 cats and they can all get used to each other. They may not all be best friends, but they can live together harmoniously even if they don't snuggle together. I hope that Rusty will like company eventually. He's only about 3 right? Bug has good suggestions. Also make sure the cat you take has been tested for the usual diseases. This site has been helpful to me, although introductions are still a work in progress, here. But I introduced very young cats to very old cats, one of whom has medical/stress issues. Who eats what, and where, is sometimes a challenge, too. Please keep us posted on what you decide, and how it goes. Congratulations on the new kitten, ankc60! Neutered male cats like Rusty are the easier cats to introduce to new ones, in my experience. Just take it slow and give them plenty of space at first, and I'm sure they will learn to get along. Way to go, ankc60, giving this kitty a home. Everyone has had very good suggestions about the slow but usually sure process of introducing a newcomer. Like Catbird, I have had great success with in-house neutered male cats accepting, and even mentoring, kittens. How many cats does this neighbor have? 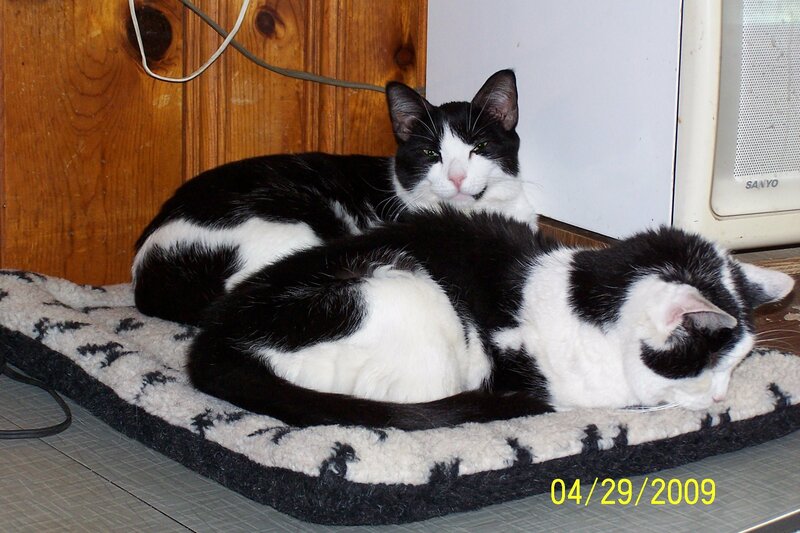 Have you considered adopting more than one so that the kitties do not have to be split up? Congratulations ankc60 on your new addition. I pray that all goes smoothly. In my experience, I haven't had problems with neutered males accepting new kitties in their home. It's usually the females that I've had a harder time with adjusting to new kitties on their home turf. I've used bugs methods many times and have found them to work pretty good. Just make sure you give them time and be patient. Keep us posted! Oh, my heart just sinks thinking of a 20 yr. old cat that needs a new home. You are an angel even to think about it. Do you know its health status, and vet. care history? Ask a lot of questions, so you know what you are taking on. Ask for veterinary records, ask how long your neighbor has had the older cat. I'd guess the 2 youngsters will ignore the older cat eventually. Do you know how these 2 get along with each other now (can they be isolated from Rusty together)? I'm not sure I'm following you about your concerns with 5 oz, vs. 3 oz cans, but maybe others will have suggestions. Do you know what this elderly cat is used to eating? I think the vaccination protocol these days is more like every 3 years (rabies, depending on state). I would think a 20 yr. old who has gotten vaccines would be sufficiently protected by now. But it's worth considering that there may be other expenses for an older cat - more frequent checks/blood work, etc. If your neighbor's 1-year-old and 20-year-old are used to each other and get along, it probably would be wise if someone were to adopt them together, that being a tall order. You are wonderful to consider this. Is the neighbor moving somewhere where she can't take her cats? It really upsets me that someone is in a situation like this. Even most senior housing will allow one pet these days. My cats range from 1 year of age to 18-1/2. The oldsters get along well with the youngsters. Like others have posted, using separate rooms for a few days should help the transition. I don't understand your question about Wellness. We know the canned is currently made at 3 companies. Menufoods, Simmons, and American Nutrition. Not too many companies make big cans of cat food. Another one I've used which costs a little less than Wellness is the Precise brand. It comes in big cans and my cats like it. I sent you a message ankc60.